Scuba Diving is Fun, here are the different PADI courses I am lucky to teach. Youth courses for younger children. Whether you are 10 years old,or retired and looking for a new past time the Open Water course is the starting point for the Underwater adventure! All you need is a few days of reading the PADI open water book and watching the video or going and learning online. Here is a PADI Junior Open Water diver. If the junior diver is 10 or 11 years old then they can only dive with a PADI Professional; However at 12, 13 and 14 years old a Junior diver may dive with a certified parent or certified guardian to a maximum depth of 40 feet. You have the Open Water Certification, your itching to dive! You are wanting to go to Catalina Island to dive the Avalon Dive park, but you are wanting a little more experience before you venture out on your own... So you pick up the phone and enquire about your Advanced Open Water Card, The advanced open water course has two core dives Deep Dive and Navigation. Both these dives will simply amaze you, navigation will cover basic compass work underwater and the Deep dive will go past 60 feet to 100 feet were you will have examples of the affect of pressure and how colors disappear the deeper we dive. You the diver gets to choose the other three speciality dives you get to do, The most common choices are Night dive, Wreck dive, Boat dive, Fish ID, Peak Performance Buoyancy..to name but a few. I personally love teaching this course, and usually the students love the challenges this course presents to them! You can be as young as 12 years old and get a Junior ranking! And also credited towards your Master Scuba Diver ranking! !This course is very rewarding and challenging most divers will agree that the rescue course is probably the best course they ever take, it builds confidence and character! It also gives you the diver an idea of your personal capabilities in responding to a rescue situation. Most Rescue Divers also do the Oxygen Provider specialty to compliment this course. Rescue divers should also have current CPR licences to. 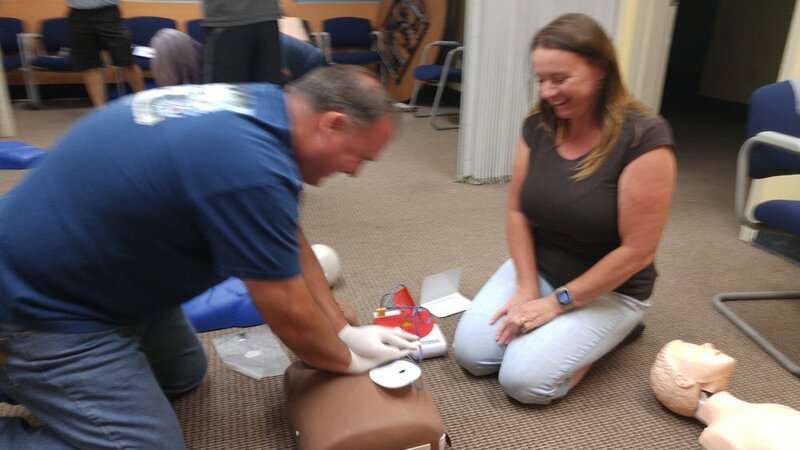 Whether you are a busy house wife, a career person in the corporate world, a school teacher or an avid diver there is one thing for sure having a basic knowledge of Primary and Secondary first aid is invaluable. We also can add how to use an AED which are also at most gyms, football fields, corporate work places, not difficult to use and easy to learn how to operate. Most of the students I teach usually ask for the full spectrum combining CPR, AED, Secondary with also Oxygen Provider. I have also taught Boy Scouts CPR and a few skills needed in the great outdoors. Specialties is sometimes why divers do what they do! They find something that appeals to them and pursue it. For example I used to dive Sting Ray City in Cayman Islands, as I worked there I can remember feeling how excited I was to be diving this famous spot, then another instructor said that the novelty would soon wear off with 50 plus dives on the same site! It never did as I really loved showing new clients the sting rays, I loved learning about the characteristics of Sting rays and the surrounding critters... But it is nice to have a reason to dive. A diver may really love underwater photography which has come along way since I first picked up a Nikon 5 ! We now are in a digital age and a wide variety of affordable to expensive cameras are available including Go Pros! I teach a variety of Specialties, every one has a purpose and as mentioned before the first dive of Deep and Navigation specialties are done for Advanced Open water divers and are credited to when the diver wants to get his/her specialty. So here is a list of the courses I personally teach some of them are no longer taught ... due to technology.. This is the highest non professional ranking a PADI scuba diver can go in the PADI system, and shows that the diver is a well rounded and experienced diver. This is also obtainable as a Junior Master Scuba Diver were the student can be 12 to 15 years old! To apply for this ranking it is important to have at least 50 logged dives in your log book. Diving is a passion and I belong to a relatively new dive club called the San Gabriel Valley Scuba Club, Iwas actually the secretary and my husband was the President of the club for 10 years. We are supported by Sharkys Scuba & Swim and meet every second Thursday of the month at San Dimas I Hop, where we get together to talk about our adventures under water and plan club dives and BBQs. We have done Project Aware Clean up, attended the yearly Chamber day and made donations to the chamber, we have organized club dives and have Christmas get togethers. Being part of a club we can share experiences and look for a dive buddy with in the club.